A downtown startup called Cookiegazm bakes 10 varieties of cookies and delivers them warm to your door within 45 minutes. 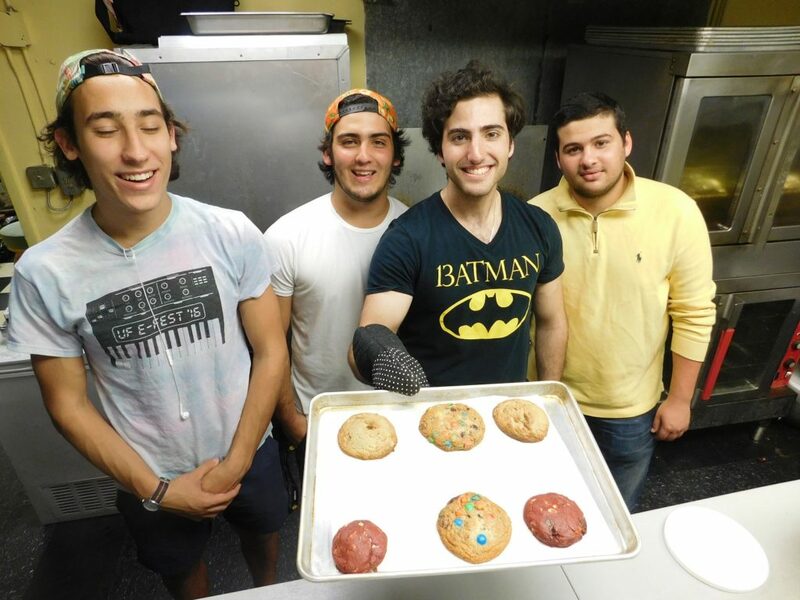 Daniel Leal holds up a tray of fresh-baked cookies with Cookiegazm crewmembers, from left, Daniel Gavrilin, 19, Roberto Giorgetti, 18, and Samuel Benarroch, 20, in the kitchen at Omi’s. Final exams loom for about 70,000 college students around Gainesville. That means plenty of all-night cramming ahead. And that means a lot of late-night cravings for sweet treats. Cookiegazm’s red velvet and peanut butter cookies. One business in downtown Gainesville caters to those cravings in the form of fresh-baked cookies and, yes, even some milk. 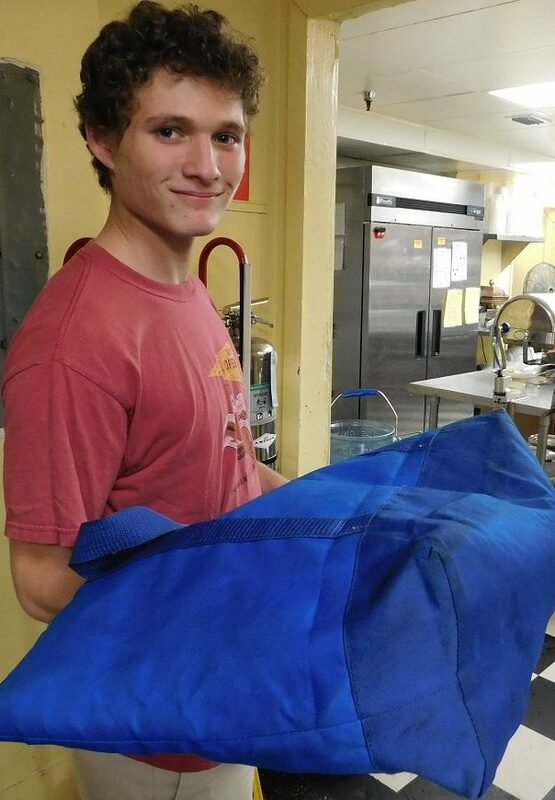 Best of all, the company delivers those warm goodies directly to UF dorm rooms and libraries, as well as to apartments and homes near campus and around downtown as late as 3 a.m.
That sound is the intense sensation of Cookiegazm. Daniel Leal came up with that provocative name when he started the business out of his apartment two years ago. Today, using the commercial ovens at Omi’s Playa Azul in Sun Center East, Leal and his Cookiegazm team—all fellow UF students—routinely bake hundreds of cookies every night of the week. During final-exam week, those numbers are expected to rise like cookie dough exposed to 400-degree heat. Starting at 8 p.m., shortly after the first order comes in, the heavenly aroma of baked cookies wafts through the catering kitchen at Omi’s. When finished, piping-hot baking sheets are removed from the oven to cool a bit before the cookies are packed in insulated containers for delivery either by vehicle or bicycle. Customers typically start enjoying their cookies within 45 minutes of placing their orders. Eliot Spector gets ready to make a Cookiegazm delivery. Cookiegazm’s menu lists 10 varieties of cookies, including such standards as chocolate chip. M&M, peanut butter and oatmeal raisin. Other temptations include cookies & cream, red velvet and white chocolate macadamia. “Premium” cookie varieties are S’mores, PB&J and Nutella. Prices range from $1 for chocolate chip to $1.50 for the three premium cookies. (All others are $1.19). For 50 cents more per cookie, you can have it customized with either marshmallow/syrup, caramel, banana slices or Nutella. Also, in keeping with Cookiegazm’s playful theme, customers can choose to “Make It Slutty” by having a whole Oreo baked inside any cookie for $1 more. Want to dip your cookies in something? A pint of milk goes for $2.50. According the Leal, the Cookiegazm baking team fills 25 to 30 orders each night. With a minimum order of seven cookies, it’s not unusual for Cookiegazm to bake and deliver more than 300 cookies on any given night. On some weekend nights, that number has approached 1,000 cookies. This has been a helluva ride, and it’s just getting started. In other words, the Keebler elves have some stiff competition. Leal, 21, is a UF sustainability studies major from Boca Raton. His Cookiegazm business partners are Abraham Ben-Moha, who is studying healthcare management, and Aaron Seemann, an industrial engineering major. All three are also Venezuelan. In the fall of 2014, Leal and his roommate started baking and selling cookies to their friends and neighbors to make a little money. They passed out fliers and pretended to be a legitimate business. Leal spent much of 2015 finding the right spot to base his business. The search led him downtown. In January, Cookiegazm opened for business out of Omi’s. In addition to its three business partners, Cookiegazm has nine employees who bake and deliver their products. And Leal doesn’t want to stop there. Meanwhile, Cookiegazm has a customer-rewards system using magnetic stickers that resemble small cookies. For every 10 orders placed and received, the 11th order (up to $15) is free. Also, during final exams, any order delivered to UF libraries will include one free chocolate cookie. 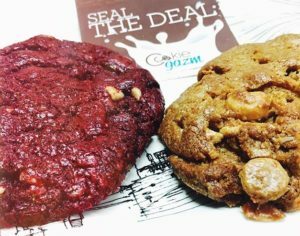 Although Cookiegazm targets UF students in its marketing, anyone within a mile of downtown can place an order for fresh-baked cookies after 8 p.m. by visiting cookiegazm.com or by calling 844.421.4296.